Julian Assange, the founder of WikiLeaks and a noted internet edgelord, will be allowed to continue to live in the Ecuadorian embassy in London as he has for the past six years—provided he stops shitposting about politics on Twitter. Per the Guardian, Ecuador’s President Lenín Moreno said this week that Assange’s ongoing asylum status is not under threat as long as Assange complies with conditions laid out by the Ecuadorian government, including a restriction on talking about the political happenings taking place in other countries. The government is ready to “take a decision” if Assanage fails to follow the rules. “Let’s not forget the conditions of his asylum prevent him from speaking about politics or intervening in the politics of other countries,” Moreno told Deutsche Welle in an interview Wednesday. Ecuador already took steps to cut off Assange’s line of communication with the outside world once this year, flipping the switch on his internet connection after claiming that the controversial figure was interfering with Ecuador’s relationship with other countries by tweeting about political events. Assange also had his internet privileges revoked in the lead up to the 2016 US presidential election and irked the Ecuadorian government earlier this year by openly advocating for Catalan independence in Spain. Ecuador’s current president has not been particularly thrilled with Assange’s ongoing presence in the country’s London embassy. Earlier this year, Moreno called Assange “more than a nuisance” and said he was an “inherited problem” from the previous administration. Ecuador’s new administration has been working to get Assange out of the embassy. Earlier this year, the government granted him citizenship in hopes that he would receive diplomatic immunity and could exit the building without getting arrested by British authorities for the two sexual assault-related charges he faced in Sweden (which have since been dropped due to a technicality). 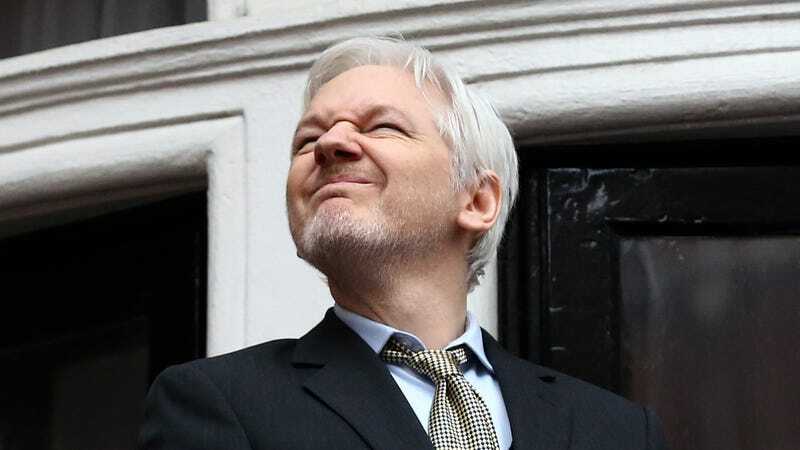 That plan, which Moreno credited to his foreign minister María Fernanda Espinosa, failed and Assange is still firmly planted within the walls of the embassy. According to the Guardian, Ecuador has invested a considerable amount of resources into protecting Assange. Over the last five years, the country’s government has spent more than $5 million protecting him. The initiative included paying an international security company and undercover agents to monitor Assange’s visitors, as well as keep tabs on staffers within the embassy and British law enforcement. Moreno seems to realize that all that money may be more than Assange is worth at this point. He’s always been a controversial figure, but he was once lauded as a person seeking truth through radical transparency. In recent years, Assange has aligned himself with fringe groups and figures including UK Independence Party leader and noted xenophobe Nigel Farage, members the Donald Trump campaign, representatives of European nationalist groups, and individuals linked to the Kremlin.